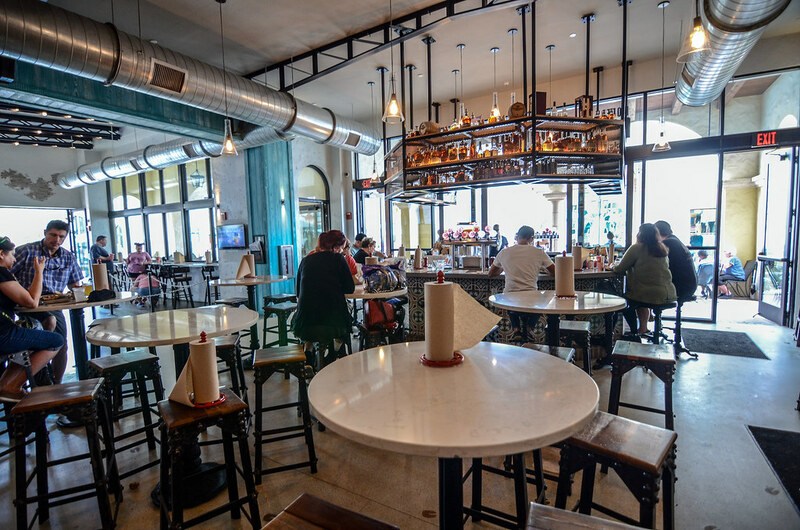 Polite Pig is a counter-service restaurant in Walt Disney World’s Disney Springs. The restaurant is locally owned and a sister location to the Ravenous Pig a few miles away in Winter Park, Florida. 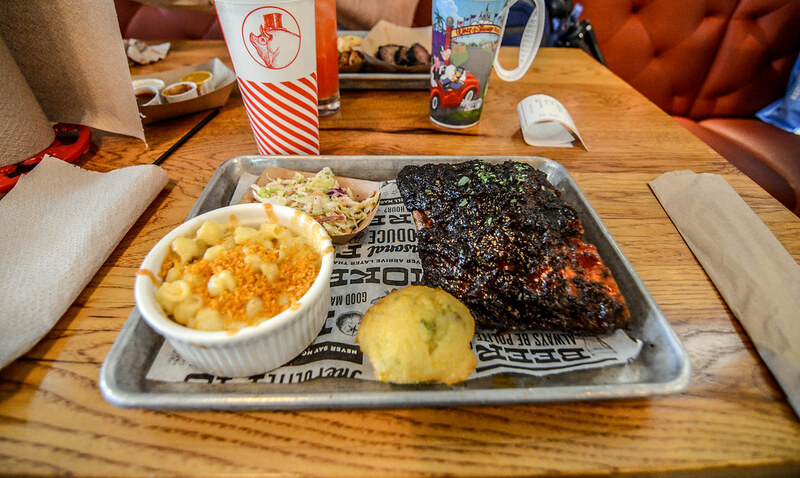 Located in the Town Center of Disney Springs, The Polite Pig offers BBQ fare with all of the meats made on a smoker. This review will include photos of the restaurant as well as our thoughts on the meal and Polite Pig’s value. The restaurant does take part in Disney Dining Plan as a counter-service credit and also accepts and Annual Pass discount. 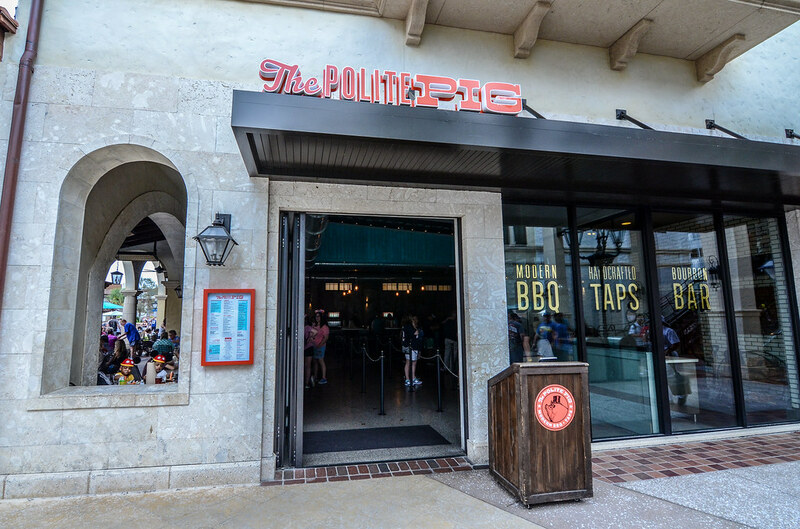 Like many of the recent counter-service additions in Disney Springs, guests order at Polite Pig’s counter and then will have their food brought out to them. For those unaware like me until some intense internet research, this style of dining is called fast casual. Because someone brings the food out to your table, it does mean that you are encouraged to tip at the counter. Frankly, this puts me off a little bit. Several Disney Springs counter-service places are now having cashiers ask guests what they would like to tip. No, it’s not a big deal in the grand scheme of things but being asked how much money you want to give a person to carry a tray out to your table is somewhat uncomfortable. Moving past the tipping, Polite Pig looks nice inside but there isn’t much theming to it. There are some nice nods to pigs, which I’m all for. Otherwise the restaurant utilizes the industrial design that has become so popular over the last decade. There are windows to look into the kitchen which is a nice touch. The bar also offers some natural lighting with large doors and windows. 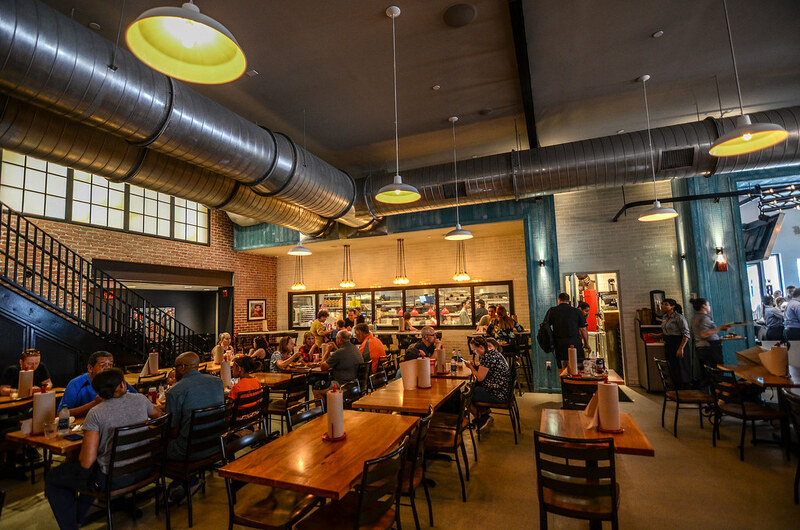 Polite Pig offers plenty of larger tables and has a nice family atmosphere. There are certainly better restaurants as far as theming goes but the environment doesn’t detract from The Polite Pig as a whole. Moving on to the food, Polite Pig’s menu is surprisingly diverse for being a counter-service BBQ place. Maybe I’m too used to BBQ spots in the parks with limited menus, but Polite Pig has a variety of entrees including sandwiches, salads, and platters. Along with that, there are plenty of different sides offered to fit most palates. I should mention that there’s a bevy of alcoholic beverages offered including a number of different beers, whisky and cocktails. For a closer look at the entire menu, click here. 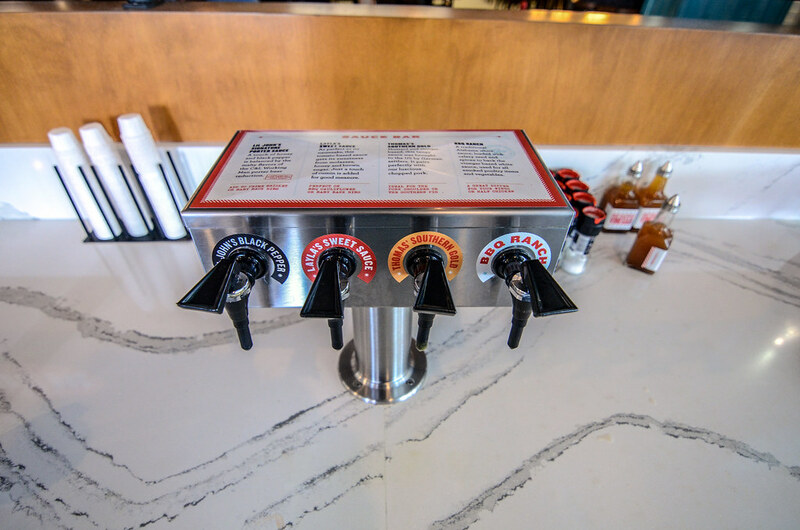 Like most Barbecue places, Polite Pig has a variety of sauces. I especially liked the Southern Gold and Black Pepper sauces. And yes, I did try them all. For my drink, I had the Polite Punch. It was fairly sweet but definitely packed more of a punch than most other Disney restaurants I’ve had cocktails at. As a whole, I think restaurants and bars at Disney Springs put more alcohol in their drinks than other places around Disney World. 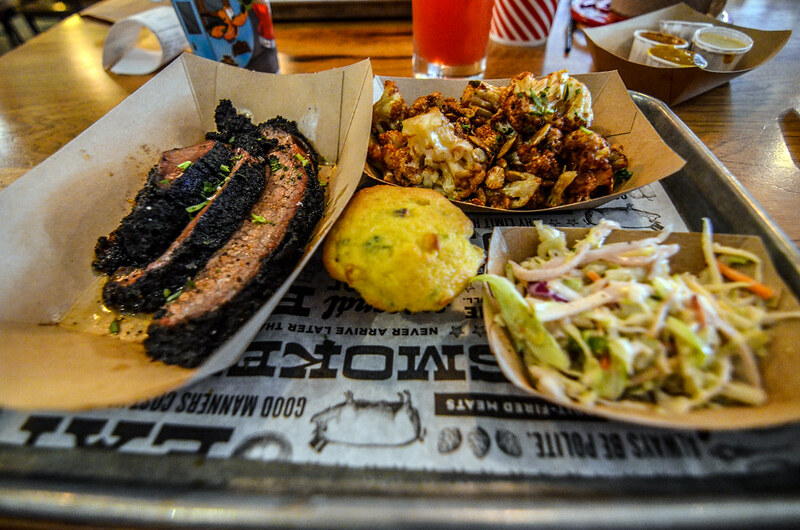 Moving on to the entrees, I ordered the Beef Brisket which came with slaw and a jalapeno cornbread muffin. For my side, I chose the BBQ Cauliflower. Starting with the meat, I thought the Brisket was smoked to perfection and I enjoyed the rub. The edges were particularly delicious. I didn’t think it was the most flavorful brisket I had but it was good, especially with the Southern Gold sauce. The slaw and cornbread were somewhat unforgettable. Both were good but there wasn’t anything that set them apart from other things I’ve tried. I do think the slaw would be excellent on a sandwich. The cornbread was sweet but not extremely flavorful. The BBQ Cauliflower, on the other hand, was exceptional. I’m a carnivore before most other things, but the BBQ Cauliflower was the best thing we ate that day and was good enough to where I’d recommend just stopping by Polite Pig and having that as a snack. Along with the cauliflower having a smoky flavor, there was a nice rub on it along with a Paprika Sour Cream and Candied Pepitas. All of this made for a sweet, smoky, and delicious flavor. Melissa ordered the ribs and Mac & Cheese as her side. The ribs were flavorful but a tiny bit dry. Again, load up on your favorite barbecue sauce and that will take the ribs to another level. I enjoyed them more than she did but we both liked the smoked flavor and the amount of meat on the bone compared to fat. The Mac & Cheese was another winner. This side was more creamy than cheesy, which I prefer in Mac & Cheese. While the flavor was rich, it was a perfect side to share along with the cauliflower. The breadcrumbs on top added some nice texture to the dish. We enjoyed all of the food at Polite Pig. The meats we tried were both prepared well and had good flavor, although not the best barbecue we’d ever tried. Our favorite portion of the meal was the sides with both the BBQ Cauliflower and Mac & Cheese being among my favorite counter-service items I’ve had in Disney World. As for the value, Polite Pig is very expensive for being a counter-service restaurant. The Brisket came in at $19 and the Ribs at $23. Once you include a drink (optional) and a tip, the meal could easily be over $30/person. Of course, there are cheaper options at Polite Pig like the sandwiches and salads. There’s an interesting list of appetizers and sides, as well, if you want to keep the cost down. But, to ordering from the meat options will set you back. While we enjoyed our meal, I don’t think I’d be willing to spend that much for a meal here. On the flip side, it makes dining at Polite Pig while on the Disney Dining Plan a complete steal. Polite Pig combines a nice family environment with solid food to make it one of the better counter-service restaurants in Disney World. Unfortunately, the cost and generic theming knock the restaurant down a peg. Have you tried Polite Pig? Let us know your thoughts or any questions you might have in the comments below. Planning a trip to Walt Disney World? Check out our Disney World Trip Planning Guide to help you out. 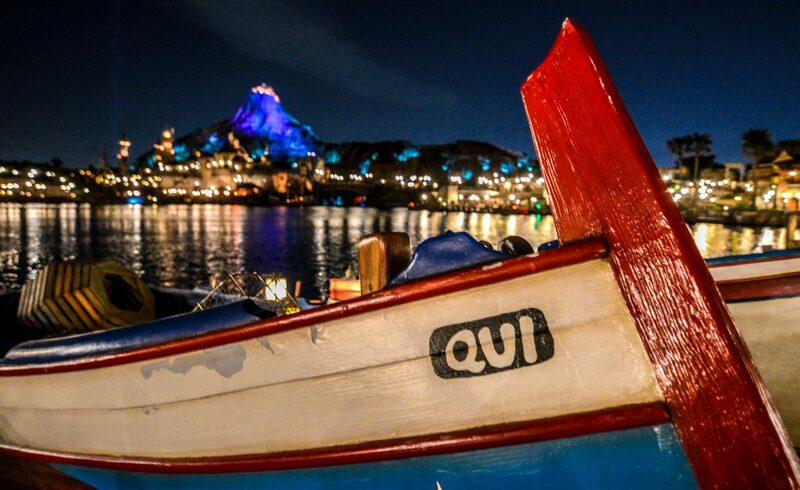 If you enjoy what you are reading here on Wandering in Disney please share this post with your friends, as well as like our social media pages. You can also subscribe to the blog via WordPress or email. All of those links are on the right side of this page. Thank you for reading, we really appreciate it!